Today is a day to remember the sacrifices of those who had died for one's country. In the United States, November 11th has been designated as a day to reflect and celebrate the sacrifices of American Servicemen, while in the Commonwealth, Remembrance Day likewise commemorates the those who made the ultimate sacrifice. November 11th was selected because of a worthy anniversary: the end of the First World War, on November 11th, 1918, the conflict that had shocked the world so much, that many hoped that it would be the last. Sadly, this never came to fruition, as humanity has continued their destructive streak across the century, and will likely to far into the future. In many ways, the trials of soldiers in the far future have provided some of the more interesting science fiction tales. When thinking to military science fiction, the first book that often comes to my mind is Starship Troopers. Robert Heinlein's masterpiece has the right tone and the right messages throughout about not only the plight of the soldier, but the responsibility and honor that veterans upheld because of their service. In one particularly early scene in the book, when Johnnie and Carl go to join the service, they are bluntly told that military service isn't the romantic adventure that seemed to have been the perception. This doesn't come too much as a surprise, as Heinlein himself was a Veteran, having graduated from the United States Naval Academy in Annapolis in 1929, and served as an officer until 1934, when he was discharged. As the Second World War roared into the lives of Americans, Heinlein worked once again for the military as an aeronautical engineer, alongside two other notable science fiction authors, Isaac Asimov and L. Sprague de Camp. Starship Troopers realistically and in a relatable fashion, sums up the soldier's experience in wartime, and demonstrates that Science Fiction can be used as allegory in a number of instances. Another remarkable example of military science fiction is Orson Scott Card's Ender's Game and related books that take place during and after. Card's character, Andrew 'Ender' Wiggen, a tactical prodigy and statistician, is a prime example of a soldier who has a varied experience with warfare - and a mixed legacy in the years following his and humanity's successes over the Buggers at the end of the book - a nearly complete and utter destruction of the alien homeworld. Ender's Game is brilliant in its use of characters - Ender proves himself in Battle School, where he uses unconventional tactics to ultimately succeed and demonstrate that he has a superior mind for this style of warfare. A second series of supposed tests are designed to prepare Ender for the invasion of the Bugger's homeworld, only to find that there was no tests - his battles were real, and he was ultimately responsible for the destruction of an entire race. Ender's story is an interesting one, compared to other soldiers, in that he never hit the front lines - rather, he was orchestrating the war from light-years away. Despite this, the war had a profound impact on Ender for his actions - a similarity that is shared with American soldiers who pilot UVAs, according to P.W. Singer in his book Wired for War. The franchise that embodies warfare in space is Star Wars. Love it or hate various elements of it, I've been greatly impressed with the stories that have been told about the Grand Army of the Republic, through a couple of different sources. The first is the Clone Wars television series, for really emphasizing on the troopers who fought on the part of the Republic. 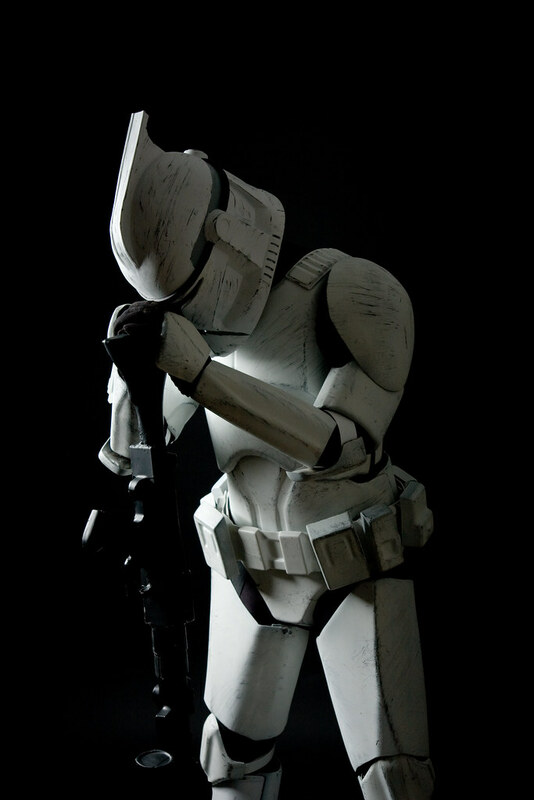 However, the real person who deserves attention for the portrayal of the troopers is Karen Traviss, with her fantastic Republic Commando series. Traviss had quite a lot of experience with the military to draw upon. As a result, Traviss goes far more into the mentality and motives of the soldiers, bringing them far more into view as people, not merely clones. Even better, the events of Order 66 seem very relevant throughout, and Traviss works hard to not only ensure that their motives for following those orders are explained in a logical fashion, but as to the intentions of the soldiers entire existence. The Clones are in a unique position here - bred only for the purpose of war fighting. For them, they're not volunteers, and they aren't expected to live beyond the war - something that the TV series touches on a little bit as well. While thinking of Traviss's Star Wars books, another good look at war comes with her book City of Pearl and the follow-up novels in the Wess'Har Wars, which examines interstellar conflict over several systems and many thousands of years. Two of her races, the Wess'Har and the Isenj, have been at war over conflicting lifestyles - the Isenj are rapid colonizers, due to a high birthrate, and did so at the cost of their environment, while the Wess'Har believe heavily in the natural world and literally applied a scorched earth policy to planets that they felt were out of line - there's a heavy environmental message here, but it does help to reinforce a point that theorist Carl von Clausewitz made, that Warfare is an extension of policy, and thus, fought on the terms of one's society. The soldiers here are deeply affected by the conflict, as several are essentially immortal, because of a parasite that they had picked up, one that ensures their survival. The long term toll of warfare on these soldiers is an interesting one, and several are noted to have killed themselves (prior to the events in the books) because of the stresses associated with their condition. When it comes to interstellar warfare, as well as the potential for long term and dedicated purpose, John Scalzi's Old Man's War is another prime example of this sort of Science Fiction. This book, the first in a series (I have the follow up book, but haven't gotten around to reading it yet), sees a world where old men and women are taken, because of their life's experiences thus far, and had their minds transferred to a new, enhanced body. There are many similarities to Starship Troopers and The Forever War (another one that I have, but have yet to read), and Scalzi has an interesting take on the enhanced soldiers and their purpose. One argument in the novel is that these soldiers have been given an artificial lease on life - the best that they can do is to continue to fight. However, in this instance, they aren't necessarily fighting for any particular cause, just the broad, overarching idea of 'humanity', as their citizenship on earth has been terminated by joining the fight in space. This somewhat bothered me, and a couple of the main characters, but highlights another, important aspect in warfare - soldiers, foot soldiers, are trained to fight for one another, to preserve their squad and fellow soldiers, and that message rings heavily through Old Man's War. Timothy Zahn has also addressed the idea of enhanced soldiers, through his books Cobra and Cobra Two, where a group of soldiers have been enhanced with a number of internal improvements - better skeletons, weapons, a sort of commando unit that are nearly unstoppable in urban combat on alien worlds. However, what really struck me with these books is that the focus is not necessarily on the fighting, but the lives of the soldiers afterwards - these soldiers, with permanent enhancements, had to adapt to civilian life where they were mistrusted and abused because of their abilities, enough to cause conflict in their homes and enough to force the entire Cobra population off world to better offerings. Military Science Fiction has its share of veterans, and examines, as a whole, not just the cool elements of science fiction, such as powered armor, lasers, epic ship to ship combat and the like, but also the impact, and continued impact that warfare will have on those that are asked to do the fighting, for whatever reason. The concept is such a large one that it is interesting to find a number of different themes - all of which might be found with any given soldier in a real military - have essentially been separated out amongst a number of novels, and examined in depth. The overall message that can be taken from this is that the hopes following World War I were unrealistic, and that humanity will continue to fight - wars large and small will continue, and no doubt, that will continue when we reach the starts. However, it is important to remember the human cost of warfare, not just on society, but upon those who ask to serve their countries, or even worlds.